ADM 2.3, only recently released, features a refreshed UI, support for Windows Active Directory and ACL permissions and support for SMB 2.0 to improve windows networking performance. ADM 2.3 also supports the latest version of XBMC (Version 13.1). XBMC can be installed from App Central and on the AS7004T supports high-resolution 4k and 10-bit movies. If you'd like to experience the new UI for yourself, ASUSTOR has updated the live demo to ADM 2.3. To give you a feel for the ADM 2.3 UI, here's a screenshot of the desktop. Performance tests were run using our Revision 5 NAS test process on four-drive unencrypted RAID 0, 5 and 10 volumes with a 1 Gbps LAN connection. The firmware installed was ADM 2.3.0.RB41. The Benchmark Summary below shows Windows File Copy read and write performance was remarkably consistent for both file copy read and file copy write performance for all RAID levels tested. (RAID 0, 5 and 10). Write performance was virtually identical across all RAID types at about 110 MB/s with read times showing just a little more variance ranging from 104.2 to 110.1 MBps. Similarly, NASPT file copy to NAS and file copy from NAS were similarly consistent across all RAID types with file copy to NAS (write) holding a slight edge over file copy from NAS for each RAID level. File copy to NAS showed the highest performance turning in identical 114.6 MB/s for RAID 5 and RAID 10. Attached storage also showed consistent and high throughput results. Backup using USB 2.0 ranged from 46.5 MB/s (EXT3 format) to 48.0 MB/s (NTFS). Backup using USB 3.0 showed identical results at 124 MB/s for EXT3 and NTFS with FAT lagging slightly at 120.7 MB/s. Likewise, backup results for eSATA were the same (120.7 MB/s) for EXT and NTFS formats with FAT trailing only slightly at 111.6 MB/s. At 67.6 MB/s, network backup is the fastest that we've seen. Similarly, iSCSI write performance was also the fastest we've tested at 107.0 MB/s. iSCSI read of 101.3 MB/s tied with Thecus' N7710-G and for all intents and purposes with QNAP's TS-251 at 101.1 MB/s. Please note that MSRP was lowered to $1130. Keep this in mind when reading the competitive comparisons below. I used the NAS ranker and filtered for 4 drives to compare four bay NASes. I sorted by both descending price and rank for different perspectives. The descending price sort shows the AS7004T at $1260 is the most expensive 4 bay NAS of the 26 currently available in our charts. But QNAP's i3-powered TS-470 Pro isn't far behind at $1241. The rank sort showed the AS7004T as not only the most expensive 4 bay NAS, but also the top-ranked four-bay. The second most expensive 4 bay NAS was the QNAP TS-470 Pro which, as noted above, is also an i3-based NAS and ranked third. Surprisingly, the second ranked NAS, the QNAP TS-453 Pro priced at $651 looks like a real bargain as compared to the $1260 AS7004T. Note: Pricing is somewhat skewed, as the Buffalo products include disks in a 4 X 1 TB configuration and the Seagate price is for a 4 X 2 TB product. The ASUSTOR and QNAP products do not include disks in their pricing - they are BYOD. Tweaking the NAS Ranker filter to include only dual-core general-purpose processors narrows the results to only four products. Again, the ASUSTOR AS7004T sits securely in first place followed by the QNAP TS-470 Pro. The image below shows the four, 4-bay dual core Intel-based NASes. For detailed performance comparisons, I decided to include the QNAP TS-470 Pro and QNAP TS-453 Pro. The chart below shows individual test results as well as category rankings for these three products. The performance summaries show rankings for all products tested (84 products), not just filtered results. So while the AS7004T has a #3 ranking for total NAS, compared to a #1 ranking within the 4-bay filter, it was bested by the $1696 Thecus N10850 10 bay Xeon-based NAS (#1) and Thecus N8850 8 bay i3-based NAS (#2). As you can see, the AS7004T had three #1 category rankings (Mixed Read/Write, Backup and iSCSI). Both the AS7004T and the TS-453 Pro missed a #1 ranking in the Video category by just a couple percentage points in the Video playback/record tests. Drilling down into some individual tests, all three NASes scored a ranking of #1 for both Windows File Copy Write and Windows File Copy Read at ~ 110 MB/s. As I've noted in previous reviews, you need to look at the individual test results for performance features that are important to you based on your intended use of the NAS. For example, if you don't intend to use iSCSI or RAID 10, lower scores for those benchmarks that reduce our overall rating might not be important to you. Looking at the numbers, both price and performance, it's clear that the ASUSTOR AS7004T is a premium-priced product with top-of-class performance. Priced at $1260, it is the most expensive 4 bay BYOD NAS of the 26 that we have tested. But that premium price is rewarded with top-rated performance in most categories. At $1241, the QNAP TS-470 Pro is the closest price competitor for 4 bay NASes. Like the AS7004T, the TS-470 Pro uses an Intel i3 processor, albeit a slightly slower one. On many of the read/write tests, it runs neck and neck with the AS7004T. With more NAS vendors moving towards virtualization, I think that memory expandability is a really important feature to consider. Currently, the three products called out above all ship with 2 GB installed. The ASUSTOR AS7004T and QNAP TS-470 Pro can each be upgraded up to 16 GB. The TS-453 Pro is limited to 8 GB (2 X 4 GB). 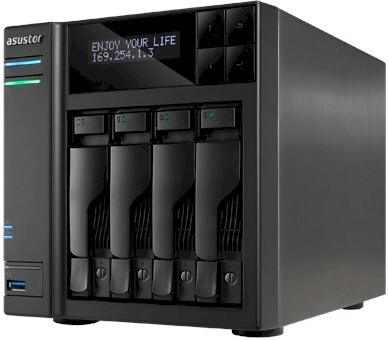 If I were going to plunk down $1200+ for a 4 bay NAS (not likely in my household), I'd probably opt for the ASUSTOR AS7004T, but it would be a close call with the QNAP TS-470 Pro as the alternative. What tips the scale for me? Top of the chart performance in benchmarks important to me. Ease of memory upgrade. The QNAP TS-470 Pro isn't really designed for easy RAM upgrade. On the other hand, expanding the memory on the AS7004T is a fairly simple matter. Upgrading the factory-installed memory requires removing quite a few more screws. But ASUSTOR has posted a video that walks you through both upgrades. S/PDIF optical audio output that supports both 5.1/7.1 Multi Channel Audio and 5.1/7.1 HD Multi-Channel Audio. 3 Year Warranty. ASUSTOR recently upgraded its warranty period to 3 years. QNAP has a 2 year warranty on SMB/SOHO NAS products and a 3 year warranty on Enterprise products. Those on a more modest budget, but still looking for a top-performing 4 bay NAS might want to take a good look at the QNAP TS-453 Pro. It offers very similar performance and features at a price that is about half the cost of the AS7004T.